Disclaimer: People with a phobia of clowns should look away now. According to NBC News, a number of creepy clown sightings in Greenville County, South Carolina have sent residents into a frenzy. According to reports made by a number of eye-witnesses, individuals dressed as clowns are trying to lure local children into the surrounding forest with large sums of money. The clowns have been spooking neighbourhoods in North and South Carolina since August, but seemed to have upped the fear-mongering recently, as three new sightings have been reported, according to Mashable. One sighting at the Fleetwood Manor apartments sparked safety worries when a local resident tweeted this creepy AF photograph of the culprit lurking by the woods, wearing a clown mask and wig. Although this is not the first time American towns have experienced harassment at the giant hands of clowns, the Greenville Police are taking these instances very seriously and Police Chief Ken Miller warned that anyone found dressing as a clown will be arrested. It’s illegal. It’s dangerous. It’s inappropriate, and it’s creating community concern so it needs to stop. This is something that we’re taking very seriously, especially because of the allegations of people dressed in clown outfits trying to lure children into the woods. Police are investigating claims that spooked residents have fired shots into the woods, in a typically American reaction. Although, frankly, we don’t necessarily blame them. In an odd twist to this terrifying story, some conspiracy theorists believe the whole circus is a ploy by filmmaker and musician Rob Zombie to promote his new movie, 31. The film, which premiered in the U.S. on September 1, follows a group of murderous clowns as they reap their sadistic games on unsuspecting carnival workers, reports IndieWire. Saban Films have released a statement, however, denying any involvement with the clown sightings in Carolina. Real or not, we won’t be sleeping tonight. 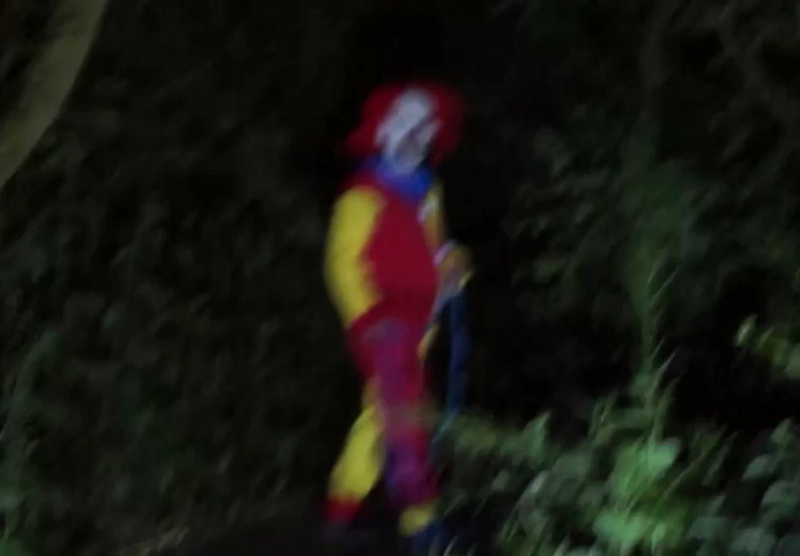 Reports of Creepy Clowns in Woods Spooking Residents of Greenville, S.C.